A pre-WWI Tuck & Sons postcard, printed in Saxony. The image is a hand lithograph. La Republique, an airship of the semi-rigid type, was built for the French Government by Lebaudy Bros., and made its first flight in September, 1908, covering a distance of 200 kilometres in 6 1/2 hours, returning to its starting point without descent. In length it was about 210 ft., while it was fitted with twin screws driven by a motor of 80 h.p. A sister ship to La Republique was La Patrie, which broke away from its moorings and was never found. La Republique in 1909 also met with disaster. 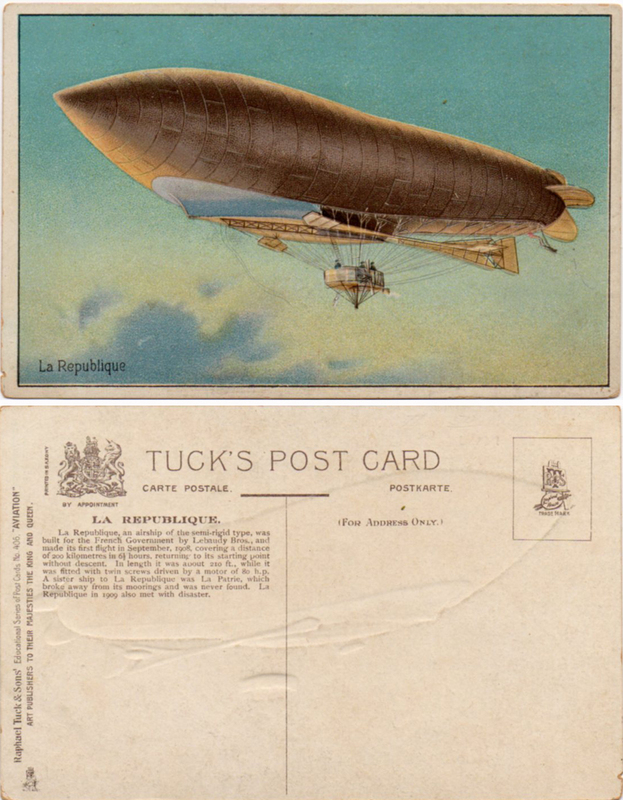 Posted in Bob Lawrence Photography and tagged "Aviation", airship, La Patrie airship, Saxony, Tuck & Sons, Tuck & Sons Educational Series of POst Cardss No. 406. Bookmark the permalink.